Then a friend of a friend talked to Michael Ryan, the former dean of Hospitality & Service Occupations at South Seattle Community College (SSCC). With his support, the organization found a site on campus suitable for the orchard, and SSCC agreed to a seven-year lease of the 1/8 acre of grass tucked away at the northern portion of its campus. On the orchard’s ground-breaking day in January 2011 a group of 40 volunteers transformed the grass into a base of cardboard, woodchips, and mulch, which was later covered with compost and soil. The planting of strawberries and herbs then followed, and in the second year, fruit trees and fruit shrubs were planted. To conceptualize the orchard, COWS used a portion of its grant money to hire Laura Sweany as its orchard manager. Sweany played a key role in not only designing the orchard’s layout and developing the planting schedules, but she also leveraged her contacts around the city to obtain mulch or compost material for the project. Underneath the 35 – 45 apple, pear, plum, and fig trees planted throughout the orchard are plant guilds composed of species that grow in the Pacific Northwest climate. These companion plantings support soil fertility and integrated pest management. With the trees only being in their third year, Nelson says it will be a few more years until they form the anticipated overstory canopy. COWS may have to revise the orchard design as the organization is not certain of what outcome will result from the interaction of the sun and canopy over that time. 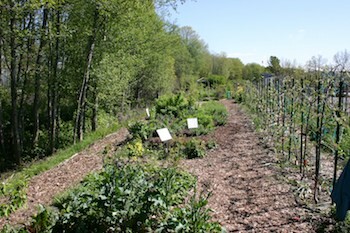 The rest of the orchard has beds devoted to perennials, medicinal herbs, and raspberry and blueberry patches. In its first growing season, the orchard yielded 400 lbs. of produce. The second year, however, did not yield nearly as much produce as the organization was in a transition period due to staffing changes. Volunteers of all ages work at the orchard; every Thursday afternoon is a work party, along with the occasional Saturdays. “We are grateful for the volunteers we do get,” Nelson says. Students at Explore West, a private middle school, have volunteered at the orchard since its beginnings three years ago. At each work party, they offer demonstrations on subjects that volunteers are interested in learning more about. One demo featured blueberry propagation while another featured compost building. Volunteers also contribute by growing seed starts at their homes and donating leaves and manure which are used to create the orchard’s compost. COWS’ sponsor is Sustainable West Seattle, and that organization provides assistance in managing the orchard’s budget. Though COWS has a budget and few expenses, the organization still must raise funds to cover rent, insurance, and compost, Nelson says. COWS also partnered with Seattle’s chapter of Eat for Equity to exchange food grown in its orchard for help in fundraisers and social media outreach. Nelson says the relationship between COWS and South Seattle Community College has been really great. The edibles class visits the orchard as part of their classwork, and some students volunteer; a portion of the orchard was even used for a student’s mycelium research project. She would like to develop collaborations between COWS and the school’s horticulture students on projects, such as growing seed starts, or having the orchard be used in other classes. “We turned a patch of grass, literally, into a permaculture demonstration garden” of what a family could grow on an average-sized city lot, Nelson says, and she hopes that their work inspires other communities to scout for land within their neighborhoods, so they can develop their own local food growing systems.